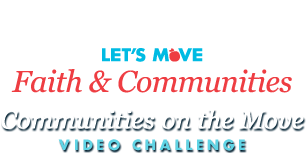 Thanks for supporting the Communities on the Move Video Challenge! 3 days remain in the Public Voting period for the Popular Choice Award. If you represent a community or faith-based organization, sign up here to be a Let's Move Faith and Communities supporter, and we'll connect your organization to more ideas and resources. Let's Move Faith and Communities promotes physical activity and nutrition in faith-based and secular non-profit organizations. Learn more about how you can empower members of your organization to improve the health of our nation's children, and gain inspiration from models and success stories from partners across the country. Winners will be announced on or about June 30, 2012. Keep up the voting! *Note: We will be fully investigating all votes before determining the winners. Just because a vote appears on the site does not mean it is an eligible vote. We check votes via a wide variety of criteria and are confident that any bad votes won't be counted. If you want to make sure we notice fraudulent votes, email us at support@ChallengePost.com with the subject "Bad Communities on the Move Votes" and include a link to the submission in question.